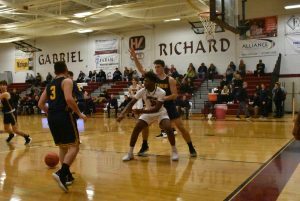 Riverview Gabriel Richard and Allen Park Cabrini met on Tuesday night for what was the second game of the season between the two Catholic League rivals. A big second quarter from host Richard helped guide the squad to a 57-42 victory and a regular-season sweep of Cabrini. With the Monarchs up 9-8 after the first quarter, the Pioneers (10-2, 7-1 CHSL Intersectional 2) scored 21 second-quarter points and held Cabrini (5-7, 1-6 CHSL Intersectional 2) to just eight. Richard also outscored the Monarchs 15-10 in the third quarter. Leading the way for the Pioneers on Tuesday was Robbie Henderson, who netted 13 second-quarter points and finished with a game-high 17. Henderson, a junior, has taken on a bigger role recently as the team has had to go forward with some players out of the lineup. One of the Pioneers currently sidelined is senior Matt Silka, who Daiek described as “the heart of our team” this year. Also for Richard on Tuesday, Kevin Tuttle and Garrett Balazsi both came away with 12 points and Deshon Elam added nine. 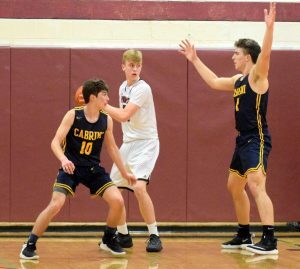 Cabrini was led by Bobby O’Guin, who scored 12 points, while Jackson Stanley finished with 11 and Jimmy Fister wrapped up the night with nine, courtesy of a trio of triples. A 3-pointer from Tuttle early in the second quarter gave the Pioneers a 12-9 lead. Fister answered with a three of his own and tied things up at the time. However, Henderson hit from downtown around the five-minute mark and soon after scored two quick baskets off of offensive rebounds to make it a 22-15 game. Nick Huiser followed with two points for Richard, while Henderson hit another three and the home team eventually went into the half up 29-17. In the third quarter, Tuttle and Henderson combined for 10 points, Elam nailed a 3-pointer and two points came from Balazsi. Cabrini countered with a pair of third-quarter triples, thanks to O’Guin and Fister, and Stanley contributed four points. It ultimately kept the Pioneers from completely pulling away, as the Monarchs trailed 44-27 after three quarters. The Monarchs did come out strong in the fourth quarter, yet it wasn’t enough to make a comeback. Fister, O’Guin and Logan Fryz each nailed a 3-pointer for Cabrini, while Stanley added four points and Jody Smith contributed two. 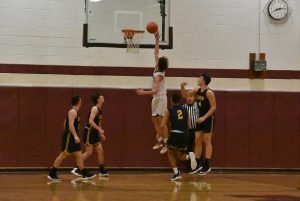 Richard offset the Monarchs with 12 fourth-quarter points of its own, as Balazsi hit twice from downtown, Mike Calhoun scored three points and two points each came from Elam and Colby Daiek. Overall, Calhoun finished the night with three points, while Colby Daiek and Huiser both had two points in the victory. For Cabrini, Smith’s last two points gave him eight for the game and Fryz wrapped up with three. Both teams were scheduled to be off for the rest of the week. 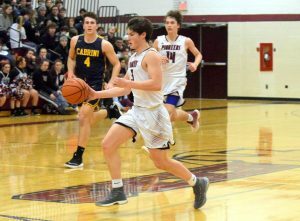 The Monarchs are set to welcome in Marine City Cardinal Mooney on Tuesday, Jan. 22 and two nights later the Pioneers will be home to face Frankel Jewish Academy.